The German government last year spent about 21.3 billion euros (almost $23 billion) in its efforts to overcome the migration crisis in Europe, with a further 21.3 billion euros allocated for the cause in this year’s budget, local media reported Friday citing the country’s Finance Ministry. MOSCOW (Sputnik) – In 2016, the country spent 7.1 billion euros on addressing the root causes of migration. Among other things, Germany tripled its humanitarian aid funds, with a further 1.4 billion allocated for regions suffering from crisis, Die Zeit newspaper reported. 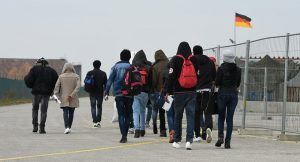 The German authorities also spent 1.4 billion euros on the reception, registration and accommodation of those wishing to obtain refugee status in the country, and an additional 2.1 billion euros on integrating new arrivals. Social transfers, during the process of reviewing applications for temporary asylum or refugee status, have cost Germany more than 1.7 billion euros in total. The report states that the government has provided local authorities and municipalities with over 9 billion euros to support them amid the influx of migrants. Germany has been the key destination for thousands of refugees and immigrants coming to Europe since the start of 2015. Some 280,000 refugees came to Germany in 2016, compared to 890,000 arrivals in the previous year, according to the German Interior Ministry. The majority of the asylum seekers are from Syria and Afghanistan.